Someone was screaming so loudly and horribly I shot out of the bed, but the hotel room was too close and absolutely dark for me to see anything at all. The screams were ragged and inhuman, and I had locked somebody's arm-- but this person wasn't resisting. He was my friend, with whom I'd flown to Port-au-Prince two days before, then driven to Cap Haïtien in the north of Haiti, and he was now talking to me in a low steady voice, trying to calm me down. As the screams stopped, I realized that they had been coming out of my own body, though not from anything I was prepared to recognize as myself. I let go of him, apologized, lay back on my bed, and immediately fell into a sleep so wet and thick it felt like someone was smothering me with it. The screaming started up again, and this time I could feel a rip through my whole psyche, like a fingernail tearing down the peel of a banana, that left the screaming thing divided from whatever it was in me that heard the screams. I had been torn out of my skin. I could not get out from under the suffocating blanket of sleep, however, until my friend dragged it off of me. I apologized some more and lay down with my eyes open. The slats in the wooden doors to the balcony did admit just a little light. Beyond the balcony and the wall protecting the compound of the Hotel Roi Christophe was a calm June night; the rain had passed earlier in the evening and the air was cool, moist and still. It was not far from the compound wall to the edge of the city-- an abrupt edge, where a narrow twisting alley ascended to become a dirt trail which passed among some makeshift shanties and emerged in an open-air hounfor where Vodou ceremonies were performed. Now in the night I could hear a desultory tap of drums, but for the moment observances were in a lull. If they became more concentrated, the drums might drive you out of yourself, dividing the parts of you from one another; you might lose your self, or be freed of it. That was what had happened to me, it seemed. Now I was in the presence of fear, but the fear was outside of me, moving in the shadows of the room, beneath a table where I'd piled my notebooks, or looming from a hanging plant above my head. The fear wandered patiently as a dog through the room till morning, while the part of me that remained subjective kept its eyes as open as it could. I had come to Haiti for several reasons, one of which was to see the differences between June 1996, when the foreign military was rapidly completing its withdrawal, and June 1995, when the intervention had been in full force. Also it happened that I had spent the last several years inhabiting an eighteenth-century Haiti composed of imagination and old texts, because I was writing a series of novels about the Haitian Revolution, a sort of tragedy which featured in its central role one of the first Haitian leaders, Toussaint Louverture. Some U.S. politicians in the States like to make it a mystery that Americans should take any interest in Haiti, but I had begun to wonder how Americans could be interested in anything else, because Haiti now appeared to me as a crucible of all the forces that created our own society, beginning like ours as a colonial system which incorporated both African slavery and essentially genocidal programs against the indigenous people, but which was then suddenly injected, between 1776 and 1791, with a lot of powerful liberation ideology. In the American and the French Revolutions, freedom was proffered to white people only, and in the States at least we all still have to struggle with the consequences of that fact. In the Haitian Revolution things had played out quite differently. Haiti is the only nation on Earth founded by black slaves who freed themselves. By 1804 there were, officially, no whites left in the country at all. Jean-Jacques Dessalines, Haiti's first emperor, declared that to be a citizen of Haiti was to be nèg, or black. To this day, Haitians regard all foreigners, whatever their melanin levels, as blancs. Haiti is a convenient place for the student of history, because time doesn't exist there, and no one ever really dies. Whether anyone approves or not, Vodou (conflated to varying degrees with Catholicism) is the religion of the vast majority of the Haitian people, and in Vodou, death is not a departure but a translation of state. At death the spirit is understood to join Les Morts et Les Mystères, a sort of aggregate Vodou oversoul that includes everyone who has ever died in Haiti, and from this oversoul a pantheon of gods is formed: the loa, who return to possess the believers who feed and serve them. The drumming of Vodou ritual builds to a crisis of possession in which the individual element of the soul vacates the body to make room for one of the loa to manifest itself. A depth psychologist might say that archetypes still walk the earth in Haiti; a mystic might say that Haitians still have the honor of meeting their gods face to face. Possessed bodies may speak in tongues or scream weirdly at the moment of crisis; it is a fearful thing to fall into the hands of a living god. It was convenient for me to believe in Vodou because the everpresentness of dead souls in Haiti made it more conceivable for me to reach the eighteenth-century personages who were the subject of my work. I had come to further my own particular ambitions, but I also had a yearning to have my individual ambitious self obliterated; this, however frightening at times, remained a strong temptation. Our program was to tour the country in a wide circle, driving up the coast road from Port-au-Prince and crossing the mountains to Cap Haïtien. From Le Cap we would drive eastward along the north coast, then turn south again to the Citadelle, Haiti's most magnificent mountain fortress, and afterward continue south into the interior, up onto the central plateau, through Hinche and Mirebelais; finally completing the circle by returning to Port-au-Prince. This was the plan, but fixed agendas aren't worth much in Haiti. Dawn finally did leak into the hotel room where I was lying with my eyes jammed opened, and as the light came in the fear went out. The first setback was that my companion woke up completely incapacitated with dysentery. I handed over the sack of medicaments we'd brought for such a case and started off toward the Citadelle in the Nissan four-by-four we had rented, with the guide who'd come with us from Port-au-Prince riding shotgun. The first blockade was just beyond the left fork of the Y intersection where the road for Port-au-Prince divides from the road for Fort Liberté. We thought nothing of the delay at first, being accustomed to Haitian traffic jams, which include goats, pigs, chickens, dogs, small children and adult pedestrians scattering like schizophrenic pinballs among the overloaded tap-taps and motorbikes and livestock trucks and small wizened witch-women riding donkeys.... Driving in this sort of mayhem requires a global paranoia. If you collide with livestock you have only to pay a disadvantageous price but if you run over a child the people are likely to drag you out of your car and cut your head off on the spot; Haitians are very fond of children. Today the traffic was complicated by a lot of black smoke which proved to come from tires burning in an improvised blockade; visibility was poor, and people were circling through the smoke, shouting angrily and waving fists in the air. "Les gens chaché ajan," the guide said, speaking a blend of French and Haitian Kreyol. "Parce ké, la vie est chère. Les gens chaché ajan. Laisse-moi voir." We had brought him principally as a translator, since outside of major cities most Haitians speak only Kreyol. Now he got down from the car and disappeared into the general swirl. I was now alone, and I felt a little lonely, because I could no longer see the guide and because although there were people swarming all over the car and a number of young men angrily signalling me to lower my window, I was unable to oblige them. Haitian weather, along with Haitian roads, is hard on sensitive machinery, and the overcomplicated electric system for the Nissan's windows had crashed somewhere between Gonaives and Cap Haïtien, leaving my window permanently shut. The windows in the back, on the other hand, were jammed half open, which would make it more convenient for the people whirling around outside to come in whenever they felt like it. I opened the door and explained in French that the window was not operational and that I was waiting for a Haitian friend in the crowd. More Kreyol-speakers understand French than can speak it in reply, and my words seemed to calm the youths, who pinwheeled off into the crowd somewhere. The guide returned, having negotiated a price of 25 gourdes to cross the blocus. I paid, and someone began hauling chunks of old engine blocks out of the barricade so that the Nissan could pass. The next blocus, about twenty yards beyond the first, involved a lot more burning tires and a lot of angrier-looking people. The tires reminded me unpleasantly of the Haitian practice of "necklacing," which means they put you inside the tires before they light them. I wondered aloud how many barricades there were likely to be along our route. "Laisse-moi voir," the guide said, and got down to approach a farouche-looking youth who was capering about with an air of authority. He wore a yellow mouchwa-têt and a pair of pink denim trousers intentionally chewed through with regular small holes, which gave them the look of lace. This peculiar costume, along with his whirling eyes and air of a Vodou possédé, distinguished him even against the general anarchy of the scene. His name turned out to be Ouayé Jean-Pierre when I made his acquaintance (enchantedly) in the backseat of the car, and he agreed to take us through all the barricades between us and the airport for the sum of 100 Haitian dollars. Prices went up, I noticed immediately, once you had a barricade behind you as well as in front. The basis for Haitian currency (as for many other aspects of Haitian life) is not to be found in the material world. All prices are marked in dollars, but no bills exist to represent these dollars, because all Haitian currency is printed in gourdes. 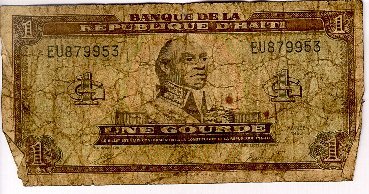 In the world of pure ideas, five gourdes are worth one Haitian dollar, while 2.8 Haitian dollars are worth one American dollar.... 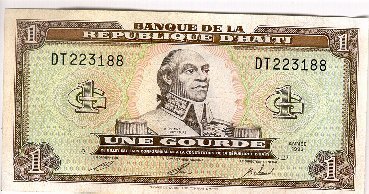 The resulting calculations are so complicated that we already had made a number of very bad deals, and now seemed as good a time as any to reverse the game, except that Ouayé was not amused when I pretended to believe that 100 gourdes were equal to 100 Haitian dollars. The end result of this negotiation was that I gave him all of my American cash as well, to dissuade him and his friends from smashing the Nissan's windows and perhaps overturning and burning it.... On the road from Port-au-Prince to Cap Haïtien we had passed the scorched hulk of a car formerly belonging to a zenglendo, or Haitian bandit, who'd had his head summarily hacked off in a different popular uprising. I paid Ouayé with a reasonably good grace, for the road ahead of us seemed to be clear, but within ten minutes of our parting from him, we had struck another blockade. I got out of the car. It occurred to me that I should be afraid, but I wasn't; the fear that had lain beside me in the room all night had now gone off somewhere else. The morning was clear. Inland, the hulk of Morne du Cap seemed to block off half the sky; two hundred years ago thousands of revolted slaves, many of them possessed by the loa, had swept down off the mountain to sack and burn the city. Within six years Le Cap had been rebuilt to an even higher level of opulence by blacks organized by Toussaint Louverture. In ten years it had been burned to the ground again by the same black men who had rebuilt it-- so that Napoleon's invading army would be denied its use. At the moment, amid the smoke and the stench of burning rubber and the shouting and boiling of the people, the cycle still seemed to be repeating itself. "On peut se retourner," the guide said, We can turn back. I nodded, since we were out of money. When a Haitian tells you that you can do something it means that you might succeed or you might fail or you might die in the attempt, and the distinctions between these options often seem to be of small importance. As it happened the demonstration had calmed somewhat by the time we began recrossing the barricades (the zenglendo element had already gone off somewhere to spend the money, we imagined), and attention had shifted to a march full of drummers maintaining a hypnotic beat with sticks on pot lids or scraps of tin-- flowing down from all the hounfors that circle Cap Haïtien just beyond the city's boundaries and gathering more people as it went. Now the people no longer seemed to see us, and the march parted around the car, then flowed back in upon itself as smoothly as a wave. Cap Haïtien, described during the days of French dominion by phrases like "the Pearl of the Antilles," is in fact a very small town, surrounded, on the sharply rising slopes of Morne du Cap, by little shanty villages and their hounfors. Today's demonstration was repeating a venerable pattern. From colonial times through the present, popular uprisings in Haiti have tended to start in the mountains and flow toward the plain, flooding from the interior out toward the coast. Often they are inspired and nourished by Vodou as well. Vodou certainly can whip up the warrior passions, but also the Haitian Revolution was able to use the interlinked structure of hounfors to establish a country-wide network very similar to those recommended by twentieth century revolutionary manuals; that structure is still in place today. For such reasons, the leaders of Haiti from Toussaint Louverture on up have publically suppressed Vodou, usually while privately practicing it themselves. François Duvalier worked artfully to reinforce the popular believe that he himself was a bokor, or Vodou sorceror, and his terrorist network of macoutes appeared to be interlaced with the black-magic underside of Vodou and its secret societies. Within Vodou, Bizango reflects Ginen as Satanism reflects Christianity; the bokors of Bizango work to harm others and consolidate their own power, as the houngans of Ginen work to heal others and serve the community. The overthrow of the Duvaliers was to some extent reflected by a reform movement within the religion, as suggested by song lyrics of the popular, populist ensemble Boukman Eksperyans: "Ginen pa Bizango." For better or worse, Haitian culture is thoroughly integrated with itself; religion will not come separate from politics. 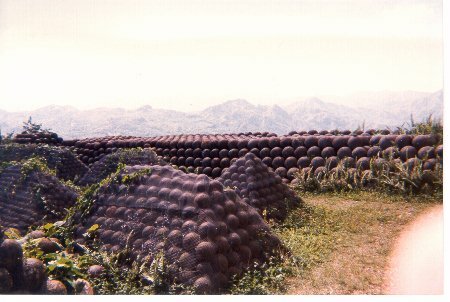 Once the guide and I had turned back from the Citadelle, we found no blockades on the road toward Port-au-Prince. Near the village of Haut du Cap we stopped and climbed a little staircase to get a closer look at a revolutionary monument near the village of Haut du Cap. At the foot of the statue a boy sat with a schoolbook open on his knees, reciting his lesson in a loud voice and staring fixedly into nowhere. Three little girls came up the stairs and stared at my white skin in utter amazement, then smiled and passed in single file along a curving path toward the cluster of tin-roofed houses in the crease beyond the colline where the monument was raised. Then an older, toothless man appeared and fell into conversation with the guide from Port-au-Prince. When Haitians meet at backcountry crossroads they may begin to speak as if they had known each other all their lives; this possibility is supported by the structure of Kreyol, which uses the same word to express both "you" and "we." This newcomer, it developed, could guide us to the remains of French colonial architecture on the mountain; such buildings are difficult to find since most were burned and razed to the ground in the Revolutionary period between 1791 and 1803. He led us first to a cluster of half-finished resort hotels which the Duvalierians of the region had begun; like a lot of Haitian constructions, they had never been finished. Even in Port-au-Prince it's usual to see rusty iron rods protruding hopefully from cinderblock structures already in use, in case some day the funds might come to build another story.... These hotels, however, had been utterly abandoned since the fall of Baby Doc. Amidst them stood the delicate remnant of a complicated colonial brick vault, and on its inner curve the fireblackened outline of a Corinthian pilaster. "Icit sé ancien maisê français," the mountain guide said. It was apparent that its builders hadn't prospered. He led us next to a boggy terrain on the other side of the southbound road, where all sorts of cinderblock structures were under construction-- a team of U.N. military engineers was supervising the raising of a building. We passed. 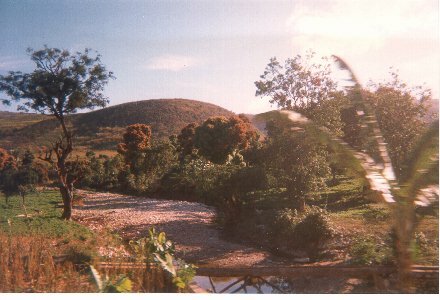 I listened to the monotonic thrum of the Kreyol conversation between the city guide and the mountain guide and learned that this terrain had belonged to a grand bourgeois under the Duvaliers, had been controlled by the macoutes during the Cédras coup, and had finally been seized by the people with the return of Aristide. Now they were making houses for the people here. But there had been no vengeance against the macoutes, who had been allowed to leave with their lives and had gone into exile, no one knew where. Such was the policy of Aristide's return, enacted, perhaps, under pressure of the international occupying forces. Yet for whatever motive, Aristide is the first Haitian leader to attempt such a strategy of reconciliation since Toussaint Louverture was deported from the country in 1802; Toussaint had effected a workable peace with wealthy proprietors from the epoch of slavery, who soon enough betrayed him. Since Toussaint fell until Aristide's election, power has always changed hands in Haiti via assassination or military coup. Since Magloire took power in 1950, the winners of whatever political struggle have always done whatever they can to murder all the losers. "Il a dit," said the city guide, translating the mountain guide's Kreyol into French to be sure I understood, "that here was the abattoir of the macoutes of that time. Here they brought each person who had contact with foreigners to be killed. The macoutes killed many, many persons here." I nodded. The mountain guide took off his hat. There was nothing in the way of bloodstains, no clear evidence of what had taken place. I imagined that the killers might have rolled the bodies down the gentle slope from the brick oven into the stream. Hogs will eat almost anything, I reflected, including human flesh. 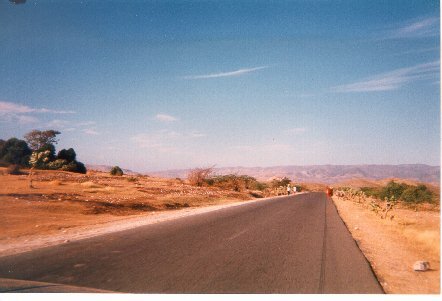 The father of the city guide had been murdered by Duvalier for belonging to the wrong political party, and when we had made the passage through the arid land on the coast road just north of Port-au-Prince, he took pains to point out the killing grounds of Papa Doc and Baby Doc in the whitely scarred hills under the blinding sun. "Here they killed many persons." As for the leaders of the military coup, they had preferred Morne Cabrit, a mountain on the road toward Hinche from Port-au-Prince. "Each night they killed many persons there," the city guide said. "This was done by Cédras, by Namphy, and Michel François. They killed men and women and left their bodies in the bush for dogs to eat. This was done by Cédras and Michel François and Namphy." The city guide leaned over from the back seat of the Nissan and pointed at my notebook. "Write their names." Now we put on our hats again and began picking our way over the swampy hummocks back toward the car. At the new construction, the steam shovel huffed and slobbered mud. The city guide paused and addressed the military engineers in his severely limited English. "Thank you," he said. He shook their hands. "Thank you." My friend was still seriously ill when I returned to the Hotel Roi Christophe. After what for him was a very monkish dinner, I went out alone. The state-supplied electricity was working for the moment, which was a sign of progress, but I didn't like it much because it meant that other people could see me. The previous June, the streets of Cap Haïtien had been ink-black after nightfall, which afforded me better privacy. This year it seemed that an unescorted unofficial white person abroad after dark was a truly remarkable sight. Fear was not operating from inside me, but roaming elsewhere like a pariah dog; still it seemed practical to get off the street as soon as possible; I didn't want the fear to find me. At the close of that evening it also seemed practical to climb the suddenly locked gate of the hotel compound rather than remain waiting outside with the people who had followed me there. Progress or not, the prevailing mood seemed grimmer than it had the year before, and the sentiment toward foreigners was beginning to turn sour. Those people in the demonstration, said the stranger at the Bon Dieu Bon hotel bar, are like the living dead. They have no hope. Nothing has changed. The Americans destroyed the old system here but now that they are leaving, they leave nothing in its place. Haiti cries to the outside world like a baby cries for its mother, but the mother must take care of the baby for fifteen years before it knows how to take care of itself. A child does not like to go to school because the masters are too strict, but the parents must make him go, so he will learn. The stranger smiled and adjusted his cap. Economic status in Haiti can often be judged by body weight, and by this measure I could guess my interlocutor belonged to the middle class. I myself have nothing to do with politics, he said. It would be unwise to do so. But those people in the demonstration are like the living dead. In Haiti, one must die ten times to win one's life. To stay sane in Haiti you must remember that if what you intended cannot take place, something else certainly will. Therefore on the following day I found myself climbing Morne du Cap toward an area called Pont Français. People kept passing me, both coming and going: schoolgirls balancing stacks of books on their heads, and women balancing huge swollen baskets of vegetables and ancient crones balancing sacks of charcoal or unthreshed peas. The path itself was very narrow and alternated between mudslide and rockslide. Its angle was seldom more than ten degrees off the vertical. Whenever I was overtaken from below, whether by small children or people old enough to be my grandparents, I would haul myself off the trail by clinging to some clump of vegetation. Passez, passez, I said. After Toussaint Louverture lost power, these terrains belonged to his successor, the Emperor Jean-Jacques Dessalines, who was assassinated before he had very much time to enjoy his empire and was succeeded, in the northern department, by King Henri Christophe. (If these titles sound absurdly grandiose one must also remember that they were strictly imitated from the titles used by the leaders of France at that time). When I had to stop and double over to try to regulate my breathing and my heartbeat, I could turn (clinging to a tree) and look eastward across the ravine toward the inner mountain range miles in the distance and see Christophe's fortress, the Citadelle La Ferrière, crowning the highest peak. I would get no closer to it, this time, but it meant something to see it at such a distance. If you imagined constructing an Egyptian pyramid or a Gothic cathedral on a summit of the Rocky Mountains it would give you some idea of the labor involved and the astonishment of its effect. But the fort was useless to Christophe in the end, unable to protect him from internal enemies; he too was swept from power by a coup. Now a little horse came up the trail, setting hooves carefully on the stones, followed by a twelve-year-old boy driving a pair of diminutive long-horned cows. Livestock in Haiti tends to be small and anxious-looking; animals wait for humans to finish before they eat. These animals were marked along their flanks with the foot-high initials of their owners, cut with the blade of a hot machete.... They passed, and a file of schoolgirls followed, whispering "Blanc, blanc," and giggling as they passed me. They wore the brown and cream uniforms of the state school at the foot of the mountain, crisp and neat and perfectly clean and without even a vestige of a sweat stain. I sat down, just for two minutes, on a mud hummock under shade; my shirt hung like a drenched dishcloth and even my trousers were sweatsoaked to the cuffs. That evening when I returned to the Hotel Roi Christophe I discovered that my two-ply leather belt had been sweated through from one side to the other, so that when I twisted it, beads of water appeared at the seam.... I sat with my dysentery-racked friend on the balcony, feeling the weight of the air increase. Crows flew urgently from the trunks of one palm to another, shrilling in something that sounded much like Kreyol. One snatched up a last lizard in its beak. Haitian crows have learned to hunt live food, as carrion is rare. A little warning wind began, and the palm leaves stirred, tossed slightly, but the rain was slow when it began, a gentle whisper. I lay on my back on a scrolled day bed, limp and exhausted and half in a daze, counting the shifts in tempo of the rain like the gear ratios on a hot sports car. Between fifth and six, lightning smashed down so loud and hard we thought a mortar round had landed in the courtyard. It was the season for storms and cyclones; the solar power system at the Citadelle had been toasted by a similar thunderbolt the night before. Now the rain became a torrent beyond measure, simply a wall of water, and all over the countryside it would be ripping earth from the eroded mountains, and the path we had climbed up Morne du Cap that day would have become a waterfall. The streams were tearing down from all the mountain villages called lakou, from the heights of all the mountains, joining to form a flood, or as Aristide once expressed it, "from an infinity of little streams was born the torrent, lavalas...."
This was the flood that brought Aristide to power; Lavalas, the political party, poured out of the mountains and the interior toward the cities of the coast, replicating the pattern of movement of the Haitian Revolution and of most internal power struggles ever since then. The Haitan defense system, from the time of the runaway slaves who were called maroons, has always depended on the inaccessibility of the mountains and the interior. In colonial times, this tough terrain meant that large numbers of slaves could escape and never be recaptured; maroon communities thus became quite sizeable, and in the mountain lakou they formed, they bore their children in freedom. During the Revolution, the maroons tended to function as a separate faction from the slaves revolting from the plantations; after independence their descendants evolved into "Cacos," whose periodic insurgencies played a part in a hundred years' worth of coups in the capital. The invention of macoutisme, which infiltrated those remote mountain communities partly via the networks of Bizango and the more sinister Vodou secret societies, was what allowed Papa Doc to hold power so much longer than his predecessors ever had. But after the fall of the Duvalier regime, those old maroon communities poured themselves into Lavalas, and as a part of that process, Ginen believers revolted against the grim stranglehold of Bizango. Dechoukaj, or "uprooting," left a good many macoutes strung from lamp posts in the days following Baby Doc's flight. Of course the founder of Lavalas is a priest, a charismatic Christian, but that presents no problem to the sunny, Ginen side of Vodou. The serviteurs see no contradiction between Vodou and the Catholicism they practice along with it; Vodou ceremonies typically begin with Catholic prayers. Lavalasien euphoria was thoroughly dampened by the coup, where Duvalierists, soldiers and macoutes reasserted their power with a bloody iron fist. Apre bal, tanbou lou is a Kreyol proverb used as a title of a 1996 book by Christophe Wargny and Pierre Mouterde which details a theory of American duplicity during the coup and its aftermath; after the dance, the drums are heavy. It's highly likely that the left-leaning Aristide was never the favorite candidate of the United States; still, however ambivalently, the U.S. did sponsor his return to his elected office-- thus making it possible for Aristide to become the first Haitian head of state since the Revolution to relinquish his post peacefully and at the end of his appointed term. But the drums are even heavier now. Due to the misfortune of his exile, Aristide never had the opportunity to deal directly with the problems which his successor, René Préval, has now inherited. Before Préval's election he was popularly thought to be as close to Aristide as two fingers on a hand; fading Port-au-Prince graffiti still cheerily proclaims: Vote for Préval, it's Aristide for four years more! In fact Préval and Aristide have (with a few episodes of friction) continued to support each other publicly, but Préval was never as personally popular as Aristide, and the strictness of his economic policy had cost him in that area. Both friendly and hostile observers of his administration tended to agree that Préval was doing what he must-- to satisfy foreign lenders and investors and the IMF-- but it involved a lot of belt-tightening, and there's not a lot of slack in the average Haitian belt. The demonstration I'd witnessed in Cap Haïtien was sparked by a state hike in the price of gasoline which infallibly led to a jump in the price of just about everything else: The people are looking for money, the city guide had said as he went to investigate, because life is so dear. Along with being a political gesture, the Cap Haïtien demonstration had functioned as a cross between an ad-hoc fundraiser and semi-organized highway robbery, but you could hardly blame les morts vivants if all they were trying to finance were their next few meals. The inaccessibility of the interior was still holding up nicely, we concluded. Given the shaky condition of the car, the probability that the evening rains had turned the deteriorated mountain roads into mudslides, and the dysentery of the better driver, the route through the Central Plateau no longer seemed feasible. Then there were certain security issues: although advice in Port-au-Prince had said that there were no such hazards on the road via Hinche, advice in Cap Haïtien said that there was considerable zenglendo activity around both Vallière and Morne Cabrit. I was further discouraged that long segments of the road we'd meant to take were marked, on the Air Force map I was using, as "nonexistent." We would return the way we had come. At the peak of Morne Pilboreau we reached a market on the frontier between the rich green northern mountains and the bone-dry peaks south toward Gonaives. Here people sell manioc and cassava bread and soursops and pineapples and green lemons and fresh bananas and everything else that grows so abundantly to the north of this crossroads-- and the reason why is obvious, as further to the south the mountains turn visibly to desert. The city guide stopped to buy cassava bread; prices here for all foodstuffs are about a quarter of the prices in Port-au-Prince. Beyond this last-chance market, the mountains on the way to Gonaives are parched and eroded beyond retrieval, worn down to the bare bones of the rock. Because of overfarming and clearcutting of the mountain rain forests, erosion has been a problem in Haiti since colonial times, remarked by eighteenth-century travelers, and a flyover shows how dreadfully far the damage has progressed since then. If it is to be reversed, the work must begin quickly. Between this summer and the last, the crazy-quilt of lethal potholes between Gonaives and Saint Marc had been repaired sufficiently to save two hours from the trip... yet here and in most of the other stretches the repairs were already deteriorating. The macadam is laid too hastily, using large stones instead of sand and fine gravel, so that any hole enlarges quickly once begun, especially when assisted by torrential rains. Also the people break the roads themselves, to force travellers to slow or stop for markets along the way, for restaurants or businesses-- it's common enough to find a ragged trench hoed across the road directly in front of a tire repair shop. In the bad old days, the macoutes and Duvalierist chefs de section maintained foot-high concrete blockades topped with metal gates, to exact a semi-official tribute from any car that passed. Those barriers have been torn down now, but the system persists, one way or another, among the people: blocus after blocus after blocus. In this manner fortunes were made by a few in Haiti, under Papa and Baby Doc and under the generals who led the coup, for after the land had been ruined beyond much further capability to produce real wealth, the get-rich-quick schemes that could still succeed were drug-smuggling and diversion of international aid. Historically, gifts of food and clothing and medicine have been converted somewhere along the road into merchandise for sale here, and gifts of money have been simply embezzled, demands renewed at each roadblock until nothing remains; the paysans and the truly needy here get the mango seed after it's been sucked dry of flesh and juice. This corrupt system might have been razed by the foreign intervention, but still it seemed unfortunate (as remarked by my acquaintance at the Hotel Bon Dieu Bon) that the foreigners were leaving without putting anything in its place. 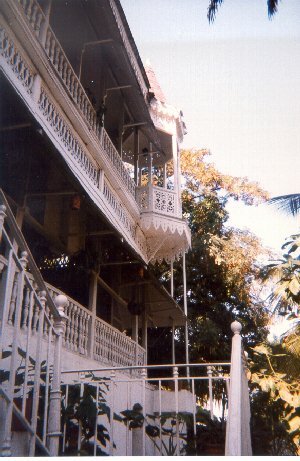 At the Hotel Oloffson in Port-au-Prince, a small green lizard walked the concrete balustrade outside Graham Greene's old room, stalking a prosperous black housefly with infinite caution and infinite desire. There was a ridge at the center of the balustrade and the lizard was using this for cover. The fly was on the other side of the ridge, buzzing, content and insouciant as the lizard moved nearer, limbs working in oily slow motion, round suction-cup toes gripping the concrete. Every so often the lizard could just raise its head to check the position of the fly across the ridge, but then it was me he saw, some chance movement I had not intended. I froze too. The lizard's golden eye rolled toward me, black ogive of the pupil focussing. He remained motionless for a long time, balancing hunger against risk. Nothing moved of him except his eye. Somewhere in the coconut palms of the hotel courtyard, a crow was waiting for him too. This was Haiti: everyone was hungry, and angling for position. The gossip among the human beings on the Oloffson gallery was also all about predation. Unrest was general, though its source was unclear. Almost everyone seemed to agree that the U.N. disarmament effort had failed more or less completely, with the result that the various underground factions were now better armed than the newly-invented Haitian police. The theory of the foreign intervention was to create a police force incapable of carrying on terrorism, but perhaps this theory failed to foresee that such a police might well become a target of terrorism. Several police officers had been victims in a recent rash of killings. Who exactly had control of all that underground weaponry was a matter of some dispute on the gallery. Members of the Haitian haute bourgeoisie believed that a left-wing terrorist movement existed, influenced and perhaps armed by outside Communist agitators, based in the Port-au-Prince slums of Cité Soleil and La Saline, and winningly titled L'Armée Rouge. Others claimed that the whole notion of an armed left-wing faction was actually a fabrication of the right-- and certainly the title "Red Army" had the odor of shopworn right-wing propaganda. No doubt whatsoever though, that a right-wing faction, comprised of former military and ymacoutes was still present and still distressingly well-armed. As before the rains, the weather smelled like trouble. In Haiti, where Vodou allows events in the unconscious to be experienced as outside forces, such changes in ambiance are almost physically tangible. By summer's end, when I had left the country and was getting my Haitian news through the internet, it seemed much clearer that outbreaks like the August 19 attack on the Presidential Palace and the Port-au-Prince police headquarters came from the quarter of the macoutes and former military; if any armed and organized "Armée Rouge" existed it had taken no action whatsoever, although there had been some populist manifestations, complete with tire-burning and machete waving. In Cap Haïtien that night in June, I had been breathing the same charged air as the people in the demonstration, and hindsight gave me a better idea about where the fear that embodied itself in my room had come from. Precisely because so little had changed in Haiti since the revolution two hundred years before, there was now a chance to build a new Haitian society directly on its eighteenth century foundation-- on the ideas and ideals which also informed the American Revolution, but in a situation where the race issue which still gnaws at the roots of our own society had been, quite radically, done away with. This opportunity seemed significant not just for Haiti but, symbolically if in no other way, for the whole western hemisphere, but it was a fragile opportunity, and looked as if it might be missed. As the delicacy of the situation increased, so did a palpable sense of dread. By the time we returned to Port-au-Prince from the North, I had come to the point of feeling these things viscerally, rather than understanding them in the conventional, intellectual fashion. My thinking, self-identified I had disappeared somewhere. I didn't miss it. Dissolution of the self is a Haitian speciality; the experience can be euphoric, as in Ginen, or terrifying, as in Bizango. Sa'w pèdi pou sa? asks a Boukman Eksperyans lyric; What do you lose for this? Your panicking individual identity answers that it's your very self you're losing, but the singers insist that in losing your individual life you will gain eternal life, as serviteurs in the crisis of possession exchange their personal identities for union with the loa and with Les Morts et les Mystères. 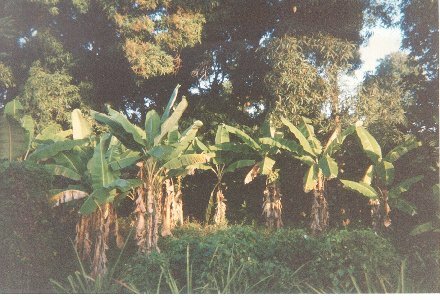 In Haiti it was still forever, but in leaving Haiti I would lose all this; it would become sa'm pèdi-- what I've lost. The obliteration of one's boundaries is always overwhelming and yet one remembers it like an addiction. 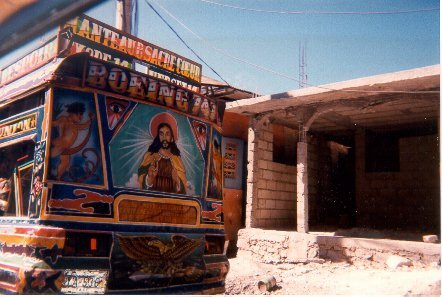 Afterward, when I met other blancs who had been in Haiti, it would be like talking to people who had been in the same war. In the end one always came to the same question: Do you still have those dreams?